Wednesday night, I finally did what I had been wanting to do for a long time. 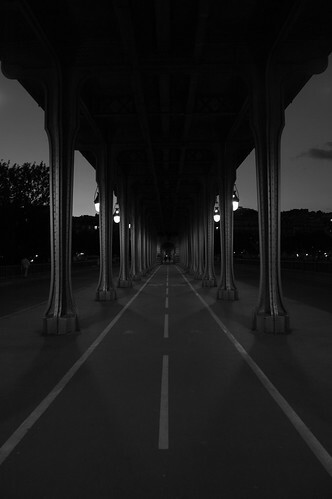 I went for a walk - equipped with my camera - to one of my favorite spots here in Paris: le Pont Bir-Hakeim. I briefly mentioned this bridge in an earlier post. 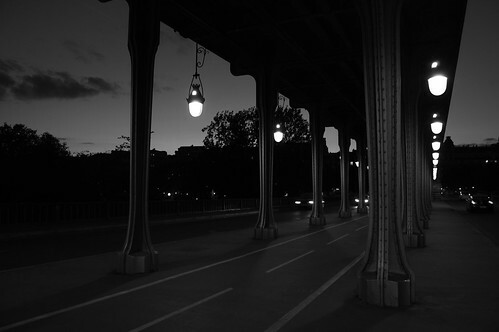 It's the bridge which connects the Bir-hakeim and Passy metro stations. 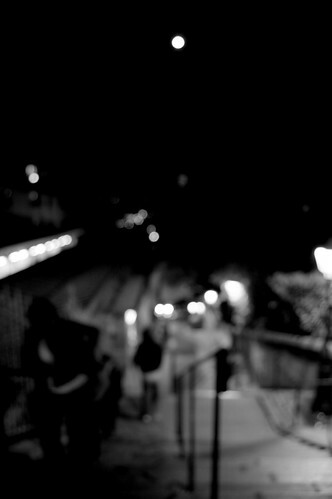 To me this two-level bridge is one of the most photogenic spots in Paris. Not only do you get a gorgeous view on the Eiffel tower from there, either when walking along it at the lower level or when traveling by metro at the upper level, but the bridge as such is quite a beauty too. During the day, but especially at night. 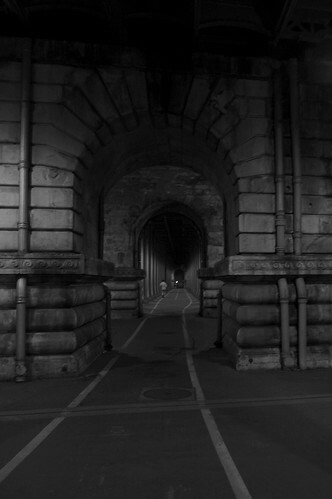 A nice piece of architecture if you ask me with its steel pillars forming a long gallery, the hanging lamps, the mysterious light they shed, the feel of walking in a dark tunnel, which it's not... 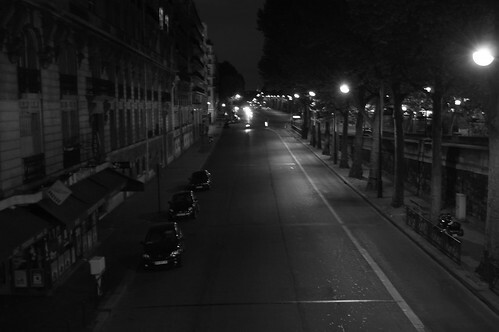 Even the cars running next to it on both sides add to its beauty and the "film noir" atmosphere. My tripod is a bit bulky and very basic - It's a hand-me-down from my brother (Thanks, J.). Though I use it quite often here at home, I've never taken it with me on an outdoor photo shoot, also because I'm a bit shy, really. (I don't want to look "too professional" as I'm not - it took me a while to feel comfortable taking pictures in public). So, actually, no, instead of taking a tripod I should make one of these - this link was sent to me a while ago by Virginia of Color Informal - thanks, Virginia! If you Google "DIY tripod" you can find many more examples - I just love these homemade equivalents to top gear equipment... Here's another solution , which I also really liked just using an... elastic! No excuses anymore for shaking hands or blurred pictures, though this picture is intentionally blurred... taken from the stairs near the Passy metro station.